It’s hard to believe we only started Mikayla’s Grace only a month ago..we have accomplished a lot in just a few short weeks. We are so excited about the possibilities that exist because we created this organization. A friend of ours that we met through our local bereavement group here in Madison, Rebecca, has offered to help us with the paper work to become an official non-profit. We have drafted our Articles of Incorporation and our Bylaws and should be sending in the paperwork to become an official Nonstock Corporation for the state of Wisconsin next week. After we get that approved, the next step is apply for the IRS 501(c)(3), which will allow us to be exempt from federal taxes and also allow all of our volunteers to be able to claim a tax deduction on any donations. It will take several months to get the paperwork approved, but we decided that it was worth the initial investment to become an officially registered non-profit. We have successfully raised over $500 in the first few weeks of our Flower Fundraiser. You can still participate in this fundraiser using this linkhttp://www.flowerpowerfundraising.com/campaign?campaign_id=4676 until April 29, 2011. We will receive the money from this fundraiser in May and June. We also set up a link on ourDonate Page, where you can make a monetary donation with a credit card or paypal account. Our first donation to St. Mary’s hospital was made on February 17th in memory of James Keith and Sophia Jewell Matejka, who were born too soon 1 year ago. That date would have been their first birthday. Their parents Keith & Claire Matejka, have been such wonderful support for us and we were honored to make our first donation in the name of their twins. We chose to donate a CD player, which was a fitting donation in James and Sophia’s name because Keith is a musician and the twins would have surely loved music too! One of the needs identified by the nurses was a CD player that the antepartum and postpartum families in the hospital can use. At the time we decided to do the donation Claire was at St. Mary’s on hospital bedrest with the twins little brother (who was born healthy this past week!). We hope that many families will use this CD player to listen to their favorite music, meditation, or whatever brings them comfort during what may be a difficult hospital stay. In addition to the first donations we received, we have volunteers that are making knit/crochet baby hats, booties, burial gowns and blankets. We also have others making sympathy cards, angel momentos, and a few other things that will go in the boxes. We are still looking for a good resource to buy the boxes and bags needed for the donations and are doing research for the best places to buy some of the items like cameras and casting kits in bulk. We also set up an amazon.com wishlist where you can see the type of items needed and even order them to get shipped directly to us. 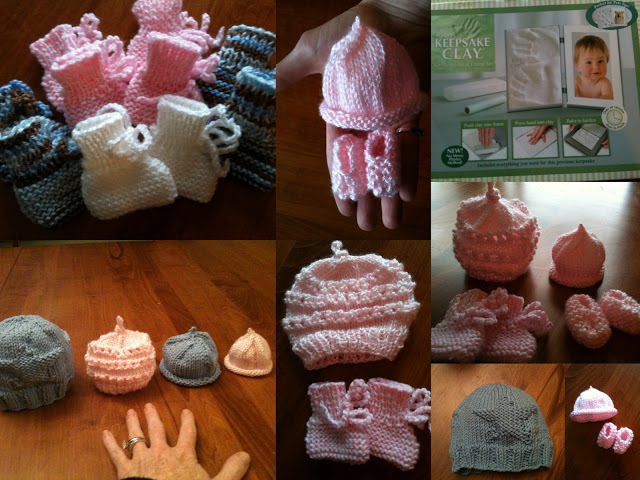 Here are some pictures of the booties (top left) donated by Mary Spaeth and also a casting kit donated by Rachel Keuhl. The rest are pictures of the hats and booties I am working on to determine a few good patterns volunteers can use to make the appropriate size baby hats and booties (more details and patterns to come soon!). There are lots of patterns available, but some are for much larger preemies than the babies we are targetting for our initial donation. These babies only weigh between 1-2 pounds, like Mikayla, and as you can see from the picture of the hat and booties held in my hands they are just tiny. Please continue to spread the word about Mikayla’s Grace by sharing this website and our facebook page (https://www.facebook.com/pages/Mikaylas-Grace/162227057163371?ref=ts). We have over 100 followers already!! We will use facebook as our main way to communicate with our volunteers and supporters, but if you are not a frequent facebook user and prefer to get your updates by email send an email to mikaylasgrace@gmail.com or sign up for email subscription on the right side of the blog. Thank you for following along and helping us help the NICU babies and bereaved parents in our community! We are so grateful for every one of you reading this! !